Ambassador Andrew Young and Robert F. Kennedy Jr. on stage during Q & A session. 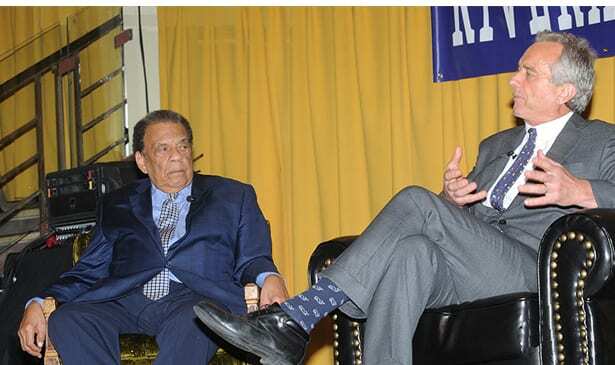 Photo by Earl Flippen, Jr.
NASHVILLE, TN — Last week, April 18 and 19, Ambassador Andrew Young and Environmental Attorney and Activist, Robert F. Kennedy Jr., were both in Nashville for two key historical events. The International Black Film Festival had a screening of the award-winning film “Andrew Young’s Making of Modern Atlanta.” Ambassador Young was in attendance for a Q&A session moderated by journalist and television personality Karla Winfrey, who served as the film’s researcher. “Since I worked on the film, I was elated to be the moderator,” Ms. Winfrey stated after the event. “It was wonderful to see the audience engage in the discussion on making sure everyone gets a piece of the pie (so to speak), when we cross racial and economic barriers,” she added. l-r; John Michael Seigenthaler, Karla Winfrey and Robert F. Kennedy Jr. during the Woolworth on 5th luncheon event. Photo by Earl Flippen, Jr.
Two years in the making, the film was directed, and executive produced by Mr. Young’s daughter Andrea Young. The acclaimed documentary chronicles the legacy of the former Atlanta Mayor’s life and his scores of public achievements. In addition, the film is laced with interviews with numerous influential Atlanta leaders and others, who all worked tirelessly to shape Atlanta into one of America’s top global cities. 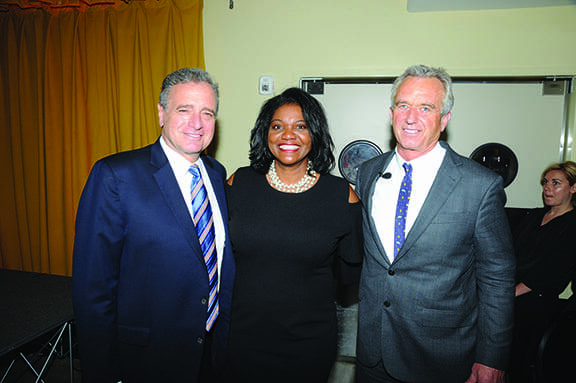 The following day, a sold-out luncheon took place downtown at the new revitalized Woolworth on 5th featuring Ambassador Young and Robert F. Kennedy Jr. The Tennessee Riverkeeper, Woolworth on 5th and The International Black Film Festival presented this noteworthy event, that later featured an intimate and powerful discussion with Robert F. Kennedy Jr. and Ambassador Young. Renowned broadcast journalist John Michael Seigenthaler moderated, with Karla Winfrey giving a special presentation to Civil Rights advocates Ernest ‘Rip’ Patton, King Hollands and Kwame Lillard.